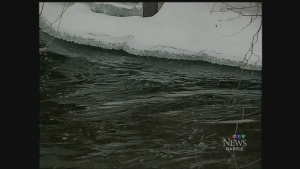 It's still too cold for the steady drip of the spring melt, but it’s on its way and many are worried it could bring high water and flooding. Steps are being taken in Muskoka to make sure there's somewhere for the melting snowpack to go. From her home along the Muskoka River, Janice Weber has a wonderful view – bounding deer and a frozen river. But even though the river is covered with ice, Weber can tell it's lower than usual. And the Ministry of Natural resources is keeping a close eye on lakes and rivers throughout Ontario, especially those that flooded last spring. Since the beginning of the month, Environment Canada numbers show water levels on Lake Muskoka have been lowered by 14 centimetres – going down 2.5 centimetres in the last day alone. It's all part of a plan to stay ahead of any flood that may happen. “Right now it's numbers on a page but it's about the potential for what it means, so there's a little prognostication that has to go on here,” says Bracebridge Mayor Graydon Smith. Smith saw how bad things got last year in his town. While there isn't a whole lot municipalities can do to prevent a flood, they at least want to get as accurate a picture as possible of what could happen when the snow starts to melt. The MNR is seeing a greater snow pack this year than in years past. But that doesn't necessarily mean the spring thaw will be worse. It all depends on how quickly it all melts, and whether rain speeds up the process. Lowering water levels cannot prevent a flood from taking place, but it can give municipalities and first responders a head start if a flood is on its way.